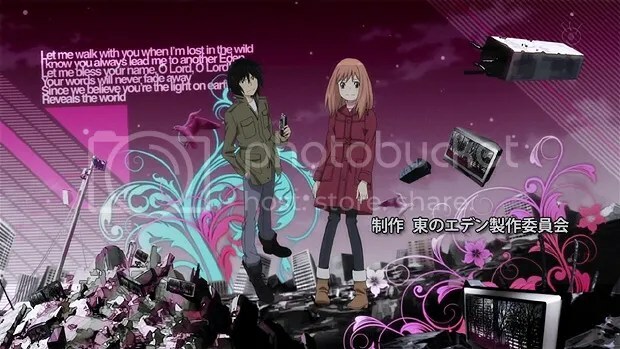 Lucky for us AnimeNEXT has hosted people from the esteemed Production I.G studio back to back. 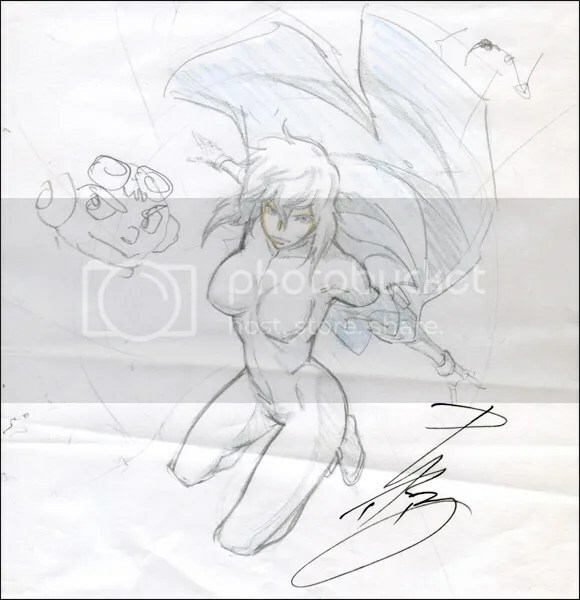 Last year it was director Kenji Kamiyama and for 2011 key animator Satoru Nakamura along with storyboarder and episode director Koudai Kakimoto visited the New Jersey convention. They are key parts to what makes the studio unforgettable and known for good quality. While they weren’t announced till very close to the con, that didn’t prevent them from being a bright spot in the weekend. Just like Otakon recently always has someone from Madhouse every year I wonder if we will regularly have a guest from Production I.G at AnimeNext. Production I.G is a great studio so if this remained a trend I would hardly be upset. Satoru Nakamura may not be as flashy a name as Kenji Kamiyama but he has a celebrated career in the animation industry and has worked on titles as diverse as Macross Plus and Steamboy to Hyper Doll and the U.S. cartoon Galaxy High School. Plus we got some amazing news out of the Production I.G panel that put Narutaki into a state of pure orgasmic bliss. One line alone was enough to make it all worth while. Their talk on Friday was a fairly calm affair where the audience got to ask a ton of questions. But Mr. Nakamura surprised everyone on a couple occasions first by asking the audience to tell him how Eden of the East made them feel. A number of people got to wax poetic about the series without fear of taking up precious question time! I told him how much I enjoyed the contrast in the first episode; starting with wacky humor and ending in true suspense. And I think the series carries a nice balance throughout. He mentioned wanting to really engage viewers and look at modern problems and solutions. Mr. Kakimoto talked a bit about the animation process and production schedules citing that the first episode of Eden of the East took them a full six months to finish. But said of course the rest were much tighter. As could be guessed there were many more questions about Ghost in the Shell: Stand Alone Complex than anything else. Nothing could be better than the second, and biggest, surprise of the event when Mr. Nakamura and Mr. Kakimoto leaned their heads together then unofficially announced more Stand Alone Complex is in the works (update: also reported by AnimeDiet since I know some people wanted more sources). Later on, I couldn’t resist asking Mr. Nakamura about why he used Ishikawa as his image in the guide for the con. He responded that he feels their personalities are very close. Both seemed happy and eager to talk with fans. I did get a few questions that got that classic Japanese dodge. I had hoped that the extremely long production of Steamboy would result in some amusing stories. Apparently Katsuhiro Otomo is a perfectionist so nothing was done until it was up to his exacting standards. I suppose that is the most diplomatic answer you can get from someone who does not want problems in the industry. Mr. Nakamura did some time as a character designer. He did not seem extremely passionate about it either way but he did mention that it seems he only did character designs on some pretty obscure shows. I wondered if he had a desire to be a director given that key animation and animation direction are often steps before being tapped as a director. While he had thought about being a director for time to time he was happy doing what he is doing. He also did not go into a lot of detail about his work on the 3D Solid State Society opening. I wonder if we could have pried out more details in a more intimate Q&A. My last question got one of the most interesting answers. I was curious to see what Mr. Nakamura and Mr. Kakimoto thought were must see anime. They of course both answered Eden of the East but they also said Nausicaä of the Valley of the Wind, My Neighbor Totoro, The Girl Who Leapt Through Time and Planetes. The Hayao Miyazaki movies were hardly surprising but it was great to see a Mamoru Hosoda and even more shockingly Planetes on that same level. I suppose it merely shows how great those two pieces of animation are. As always I behoove people to go see the Japanese guests! They are an amazing window into a medium that we all love so well. Both Mr. Nakamura and Mr. Kakimoto play significant roles in the creation process. And for the most part we rarely get to speak with a key animator or storyboarder in the U.S. con circuit. I saved a few question in reserve just in case we got an interview but that never came to pass. I was waiting to ask him about Galaxy High School as I would have liked to have known the difference between his feelings on making a show for America as opposed to Japan. Que sera, sera. If nothing else if AnimeNEXT could get more staff that works at Production I.G I would love to see more. If they could get Kazuhiro Furuhashi or Tsutomu Mizushima that would be greatly appreciated. 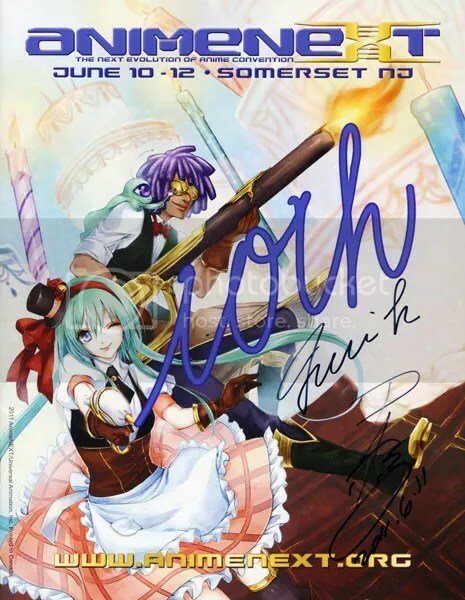 Furuhashi’s work on Le Chevalier D’Eon and Mizushima’s work on the upcoming Blood-C would make them amazing guests. I can’t wait to see who they get next year. Pingback: A Gabriela Robin Site » More Ghost in the Shell:SAC in the Works?